These are the following areas that will be open on Saturday. should expect limited services and parking, long lines, and no potable water. cautious due to new hazards. dangers of this dynamic natural process and stay out of closed areas. During this morning’s USGS over flight of Fissure 8.There was a weak to moderately active pond of lava bubbling within the fissure 8 cone, but no visible supply of lava from fissure 8 into the channel. The perched channel and braided sections downstream were essentially crusted over with some incandescence noted. Active flow in the channel was observed immediately west Kapoho Crater. 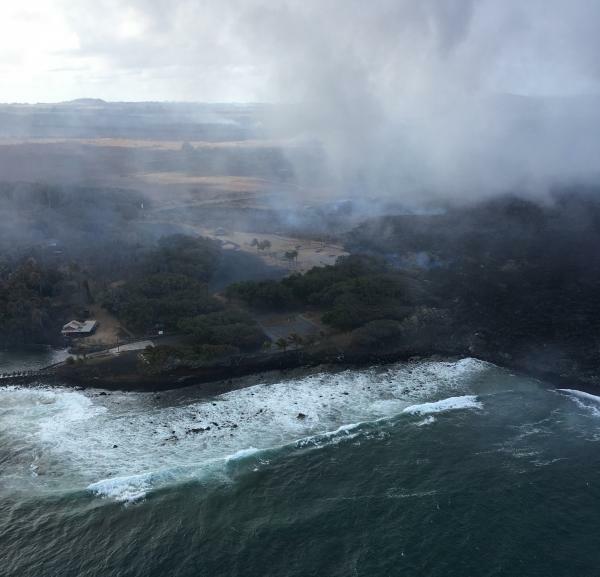 There is still active lava flowing into the ocean along the coast. it stretches about a mile long as of this morning. The Pohoiki Boat Ramp and Red House is still standing but there is some activity there. It did not have any significant advancement over the weekend. 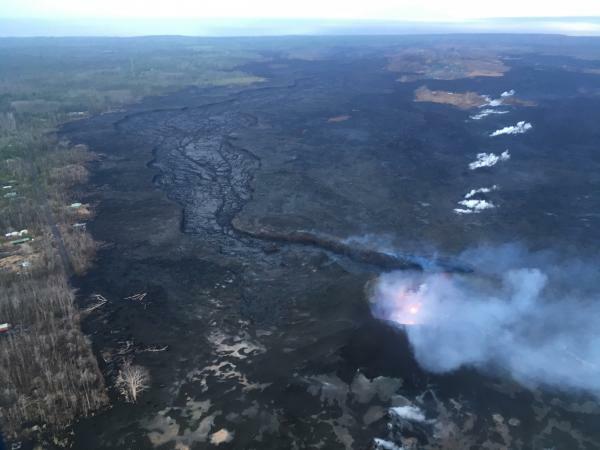 Hawaii Volcano Observatory geologists observed low levels of lava fountaining within the fissure 8 spatter cone and crusted lava in the spillway and channel downstream. The significance of this change is not yet clear. Eruptions can wax and wane or pause for days to weeks before returning to high levels of lava discharge. New outbreaks in the area of the active fissures could also occur in the near future. Collapse at the Summit this Morning. The ocean entry has expanded to the southwest. 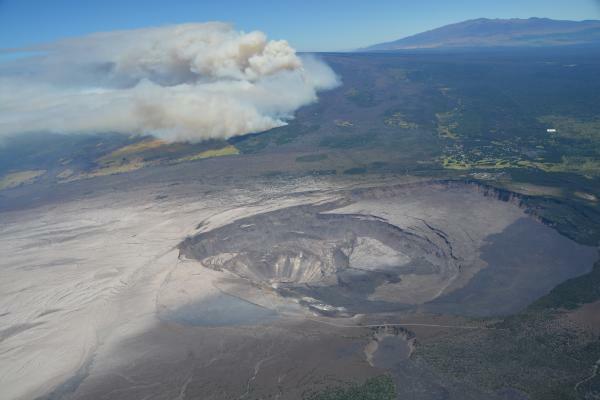 Fissure 8 has produced a cinder cone with lava fountains reaching as high as 200 ft (60 m.). Spatter has built up the cone to the east and into the channel. The spatter in this photo lands on the east cone and flows downward. Halemaumau is forever changed. The Lava Lake has disappeared. UAS survey of Halema‘uma‘u crater rim, at Kīlauea Volcano’s summit, June 13, 2018. 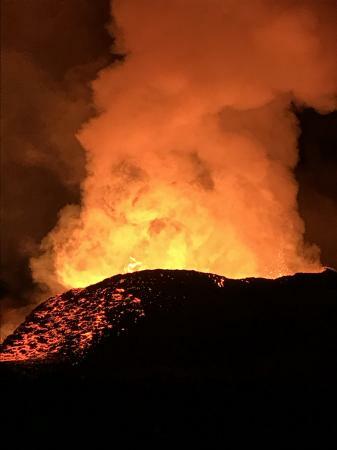 UAS mission on June 13, 2018, filmed details of the dramatic changes occurring within Halema’uma’u crater at Kīlauea’s summit. Clearly visible are the steep crater walls that continue to slump inward and downward in response to the ongoing subsidence at the summit. The deepest part of Halema‘uma‘u is now about 300 m (1,000 ft) below the crater rim. This video was taken from a UAS (Unmanned Aircraft Systems). Limited UAS flights into this hazardous area are conducted with permission and coordination with Hawai’i Volcanoes National Park. The overflights collect visual information on what is happening at this rapidly changing eruption site. 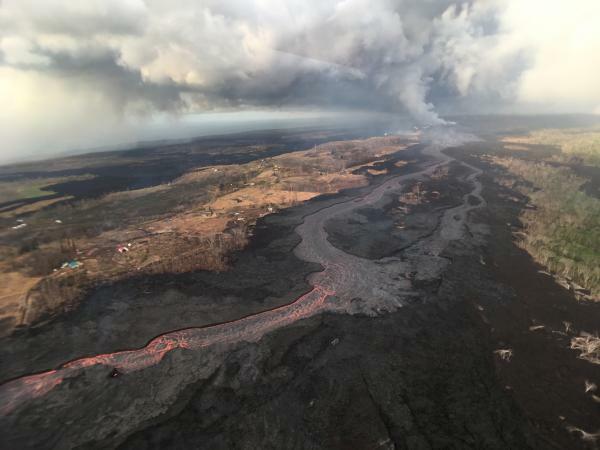 Scientists will be examining the footage in detail to understand how the expanding collapse area is evolving, the extent of tephra fall, and other clues as to what is happening at Kīlauea’s summit. This information informs assessment of hazards, which is shared with the National Park Service and emergency managers. 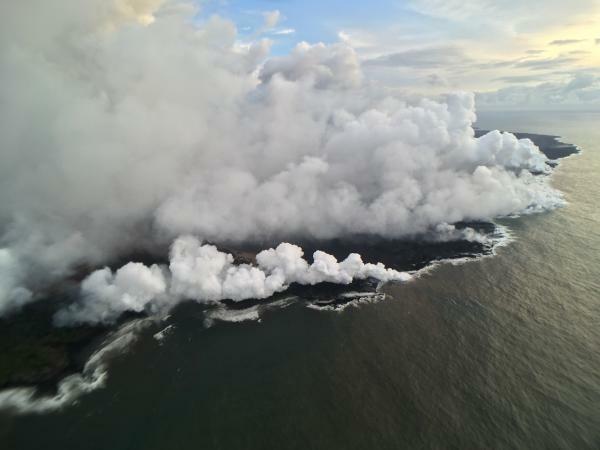 Video by the U.S. Geological Survey and Office of Aviation Services, Department of the Interior, with support from the Hawaiian Volcano Observatory and Hawai’i Volcanoes National Park. 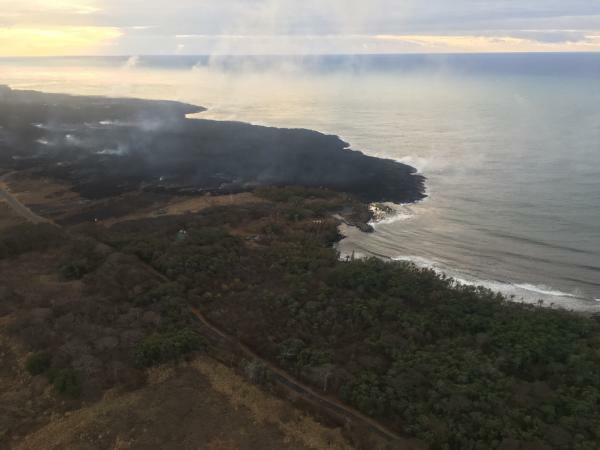 Fissure 8 continues to pump lava fountains up to 200 feet into the air. On occasion even higher. What the Hawaii Lava Flow Looks Like. 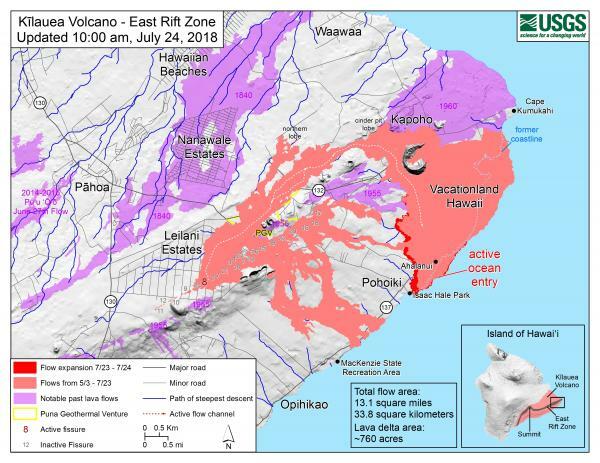 The tiny red area to the right is where the lava flow is located. It is not a threat to the rest of the island. Pohoiki Boat Landing is Still There. Copyright © 2014-2015. Volcano Vacations Hawaii. All Rights Reserved.